The China-Maldives Friendship Bridge has reached the final phase of the project of connecting the main columns. Talking about the progress of the bridge project today, Housing Minister, Dr. Mohamed Muizzu told Sun Media that they are currently working to connect the main columns of the bridge. 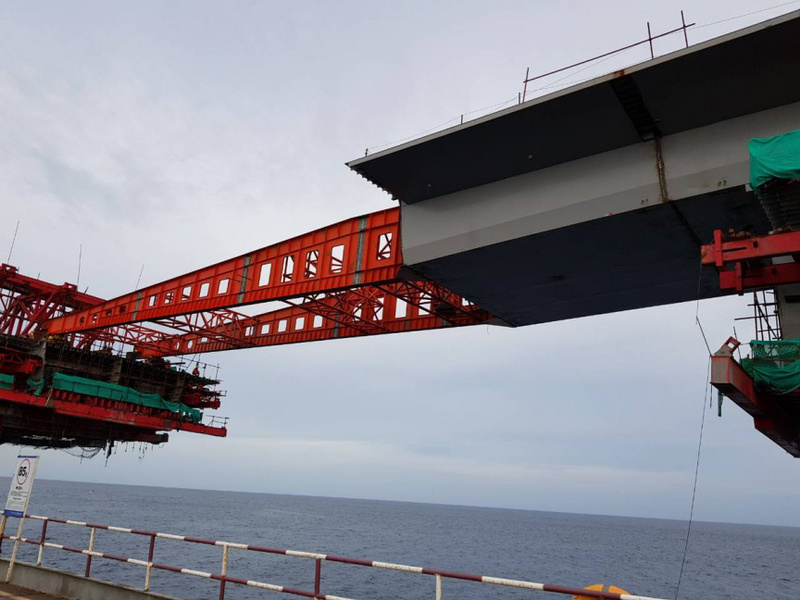 Dr. Muizzu said that main columns are being connected by the steel-box girder beams being brought from China. And so the piers 21 and 22 are now being connected and is expected to be completed by 12 June. As the last phase of the project is underway, the Housing Ministry said that the project is on schedule and the ministry is working to hard to complete the work on the roads connecting to the bridge. A total of USD 300 million is being spent on the bridge project out of which USD 100 million is free aid from the Chinese government and USD 170 million comes as a loan from China with an interest rate of 2 percent. The Ministry of Finance and Treasury has said that the Maldivian government will be spending USD 30 million on the China-Maldives Friendship Bridge.